We are receiving very interesting reports of Trumpeter Swans with neck collars and wing tags this winter as part of our Citizen Science effort, Trumpeter Watch. Reports of all Trumpeter Swans in states near or south of the 40th parallel will help us better understand the winter distribution of expanding High Plains and Midwest nesting flocks. The program will run through May 1 each year. We will then tally all data gathered and make it available to wildlife managers throughout the pertinent flyways and on our website. Reports of marked or banded birds are particularly valuable as we can trace the origin of that bird by coordinating with the biologists who marked and banded them. Often swans are seen at a distance, but that extra effort to read numbers on the collar or wing tag can be of great value. Here are some tips on how to read and report marked and banded birds properly. All banded and marked birds should be reported to the U.S. Geological Survey (USGS)'s Bird Banding Lab (BBL). The BBL must authorize the banding and marking of any migratory bird in the U.S. If the silver leg band can be read, then no other marker description is needed. If there is no silver leg band or it cannot be read (often this is the case), then careful notes on other markers (with a backup photo if possible) are important. The BBL has an easy online form for you to report a marked bird. Describe the type of marker. Collars and wing tags are both commonly used in the United States and Canada. State the Color. Red, green or yellow collars are most often used for Trumpeter Swans, while gray, black or blue collars are most often used for Tundra Swans. For Trumpeters, color often gives indication of the state or geographic area of breeding. For Tundras, gray is used for wintering Atlantic Flyway birds. Black indicates birds marked on migration routes, and blue indicates birds marked in Arctic breeding areas. Record the unique Letter (L) / Number (N) combination. Most Trumpeters have three characters with one letter (LNN, NLN, NNL) (N=Number, L=Letter). Tundras have 4 character combinations with the letter first (LNNN) - or 3 character combinations with two letters (LLN, LNL, NLL). There may be a few Trumpeters remaining from the old banding protocol that have yellow or black collars with 4 character combinations of LLNN. Mute swans have white collars only, with 4 characters LLNN. In addition carefully describe the date, location, number of cygnets (gray coloration) and adults (white) (if possible), and other marked or unmarked swans in the group. Notes on behavior are appreciated as well. Be sure to note your name and contact data. An observation form is available on our website in the TRUMPETER WATCH section. 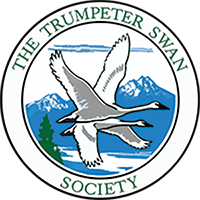 If you send a copy of your sightings report to us at The Trumpeter Swan Society, we usually can get information to the biologist most familiar with that group of swans quickly. The bander typically will report back to the observer as well as to TTSS directly, as time permits. Keeping in mind that lists like this are obsolete almost as soon as they are printed, click here for a few tips on the marked Trumpeter's possible origin, or place of marking.